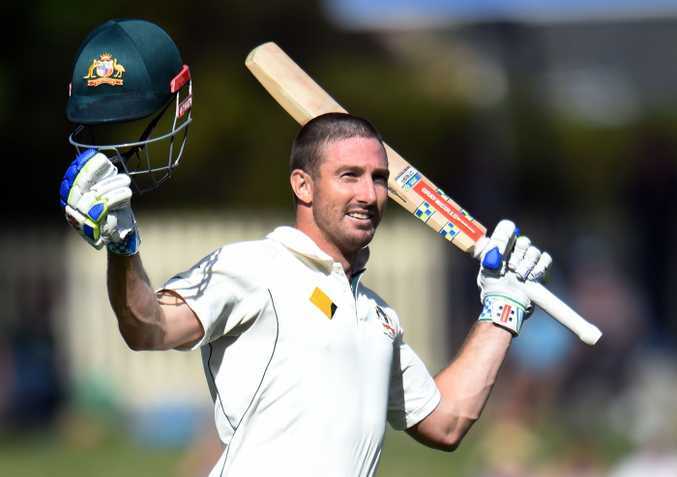 AN UNBEATEN century by under-pressure batsman Shaun Marsh gave the Australian selectors plenty of food for thought on day one of the first Test against the West Indies in Hobart. Marsh has been unable to cement a spot in the side, and was expected to make way for Usman Khawaja in the Boxing Day Test, with the Queenslander having recovered from a hamstring complaint. The West Australian was 139 not out at stumps after putting on an unbeaten 317 for the fourth wicket with fellow West Aussie Adam Voges, who had reached his highest Test score of 174. That partnership was just 19 runs behind the record Australia v West Indies fourth-wicket partnership of 336, set by Bill Lawry and Doug Walters in the 1968-69 summer. The pair got the home side out of a spot of trouble after it lost three wickets in the morning session. The first to fall after Australian captain Steve Smith won the toss and elected to bat was Queenslander Joe Burns, bowled for 33 after an off-cutter from Shannon Gabriel burst through his defence, with the score on 75. Smith then went for just 10, the victim of a good drifting and turning delivery from left-arm orthodox bowler Jomel Warrican, with the Aussies on 2-104. Warrican then took the prized scalp of opener David Warner, who had been at his aggressive best before he perished for 64 from 61 balls, trying to glance a ball down the leg side. Shaun Marsh celebrates his ton. That was in the last over before lunch, the tourists no doubt harbouring thoughts of running through the middle order which they had identified as the weakness in the Australian line-up. 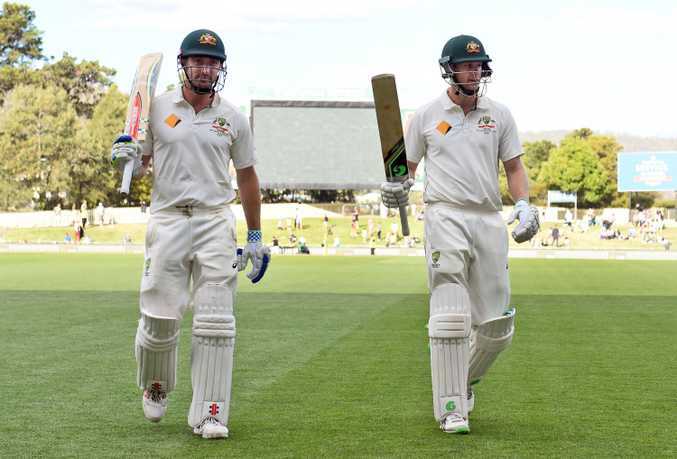 Voges and Marsh completely dominated the next two sessions, however, feasting on the bowling which was sub-standard for Test level, and taking advantage of the ultra-conservative field placings. Voges, 35, who became the oldest Test debutant to score a hundred against the West Indies earlier this year, moved to third on the list of highest scores in a Test at Hobart - behind Kumar Sangakkara (192) and Ricky Ponting (209) - and will have the record in his sights this morning. Marsh was visibly relieved to reached three figures, just his third Test ton, after he ran himself out for 99 against India in Melbourne last year. After reaching their centuries, they opened up in the final session, picking off 136 runs from 26 overs at 5.23 per over. The Aussies will no doubt be targeting another 200 or so runs today before looking at a declaration. Who are the West Indies?